Apple has beaten Wall Street analyst estimates with 31.2 million iPhones sold during the past quarter, but its 20% growth year-over-year didn’t stop the company from losing market share, according to IDC’s recent report. As the market research company points out, the smartphone market has grown 51.3%. Vendors shipped a total of 236.4 million smartphones during the second quarter of 2013, up from the 156.2 million reported for Q2 of 2012.
iOS has finished the quarter maintaining its No. 2 position in the global smartphone market, showing that even without launching a new iPhone model, the demand for Apple’s handset remains strong. The growth was helped by new wireless partners, IDC highlights. The impressive growth of the smartphone market has affected Apple’s performance. 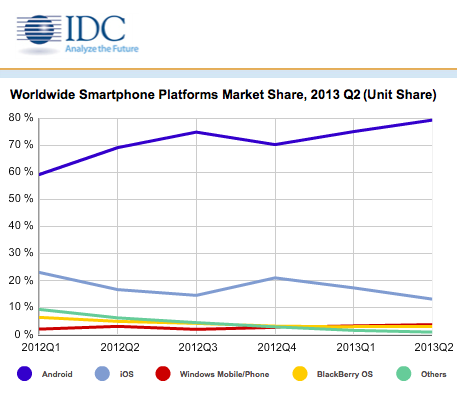 Its mobile OS now accounts for 13.2% of the global market. 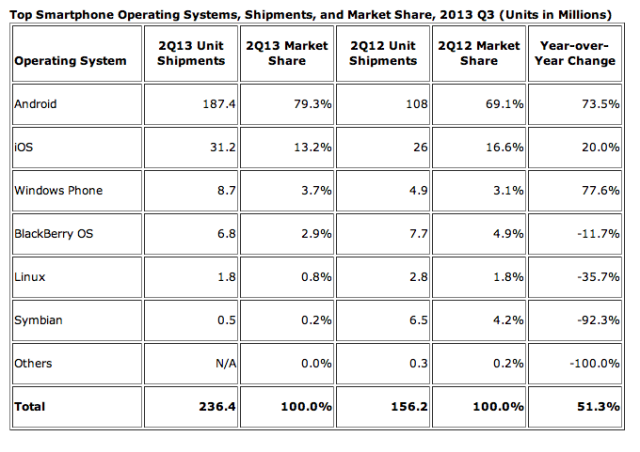 By contrast, its share was 16.6% in Q2 of 2012. Android, on the other hand, has grown 73.5% on a y-o-y, with vendors shipping 187.4 million units, grabbing nearly 80% of global market share (79.3%). Android’s growth however, was outperformed by the Windows Phone, which has seen an impressive 77.6% growth y-o-y, and now accounts for 3.7% of the market.